I’ve been a therapist for 35 years and I’ve focused on working with couples for the past 25 years. I’ve seen methods come and go and have been privileged to have extensive training with the best in the field. Even though I saw progress and change with my couples, I always felt something was missing. I couldn’t name it I didn’t know what it was but the FEELING was clear. In 2005, I attended the AzAMFT conference featuring Dr. Sue Johnson talking about Emotionally Focused Couples therapy. During that conference, I had the DUH! moment. Of course, what was missing was a way to work with the EMOTIONS. That workshop changed my life, and my practice. Really! With that conference as the jumping off point, my husband Douglas (an MFT) and I began our formal training in EFT. Many hours, dollars, books, videos and supervision hours later, we are SO glad we did. EFT truly revolutionized our understanding of human attachment, adult love and bonding. 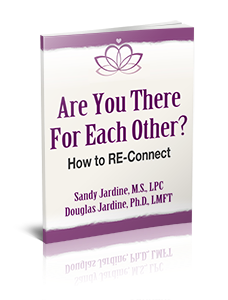 EFT gave us a detailed map on HOW to help couples repair their relationship at the deepest levels. We discovered that the pain we saw daily in our office was about the damaging cycles that develop when we are inaccessible, unresponsive or non-empathic with the one person who means the most to us. As a bonus, we used what we learned to deepen and grow our own marriage. ITS ALL ABOUT ATTACHMENT- ARE YOU THERE FOR ME? Emotionally Focused Therapy is a highly researched, empirically validated approach that relies heavily on John Bowlby’s Attachment Theory. According to the research, humans are “wired” for connection. We are not meant to go through life alone. In sharp contrast to the individual focused, Western view of adulthood and maturity, attachment theory states unequivocally that we need each other to survive and thrive. Study after study demonstrates that when we feel securely attached to our partner; we are more likely to feel calm, centered, confident and safe in the world. We are also more resilient when life is hard and we have to face scary things like a health crisis, financial reversal, or other painful or traumatic situations. Couples who experience relationship distress all report feeling disconnected to their partner at key moments in the relationship. These moments lead to a predictable and painful set of patterns that further distance the couple from each other. Sometimes the pattern is angry and attacking; sometimes silent, seething and withdrawing; sometimes a combination of both. In any case, by the time the couple arrives in our office, the love and connection they once felt for each other is replaced by anger, hurt, frustration, criticism, hostility and sometimes hopelessness. After alliance building, the next task is to help the couple understand and make sense of the repetitive pattern that has gotten them caught in this awful dance of anger, hurt and distance. Once the couple has a deep, emotional understanding of their pattern, it is much easier for them to see the pattern as the enemy, not each other. The defensiveness, anger and criticism begin to subside and couples report they are starting to feel a bit safer and more connected. The goal of EFT is to create a secure, safe bond between the partners. That does not mean they won’t ever fight or get disconnected. A safe secure bond means they can talk about their needs and vulnerabilities and seek each other out for contact, care and comfort. It also means they know how to repair when a disconnect occurs. The role of the therapist is to ATTUNE to each partner and help them make sense of their experience. Dr. Sue Johnson states that “relentless empathy” is what is required from us as therapists to make sense of behaviors that at the surface seem “crazy” but make sense if we view it from an attachment lens. EFT sees the therapist as a respectful collaborator, a process consultant and a choreographer of change events. It is our job to help each partner become aware of and express their emotions to each other. It is also our job to help partners learn to tolerate and regulate their emotions. There is no doubt that this is the hardest, most demanding and most rewarding work I’ve ever done. It requires me to attune and track multiple levels of emotion and sensation. It requires me to help soothe and co-regulate with people who are profoundly hurting, ashamed and afraid. It requires me to help people make sense of what feels out of control and desperate. I come home tired, often drained, but more often exhilarated by people’s ability to reach for each other, give each other another chance, have compassion for each other and themselves, and to open their hearts to each other again and again. This work requires me to be real. Some days it is really hard. Most days, it feels liberating. By being authentic it gives people permission to risk being real with each other. Being real sometimes hurts. Sometimes their stuff triggers my stuff. Even as a veteran therapist, I am not immune to having my own history pricked by one of my clients. Doing this work means I need to seek out safe places for me to process my own stuff. My husband (also an EFT therapist) is my best place to go to talk about such things. I have a long-time consultation group I talk with. I also have peer therapists I can rely on for guidance and support. It is not possible to do this work alone. We need each other. If you would like to learn more about Emotionally Focused Therapy, feel free to contact me. I provide EFT Consultation and Supervision individually, in groups and online.